Friends, I'm just going to say it. You need to make these muffins. The recipe is courtesy of Joy the Baker (both on her site and in her book). They. Were. Awesome. I made them last Friday and they were gone by Sunday. Granted, I did take some to Boyfriend's parents so we did not eat them all on our own, but man. Delicious. I was slightly worried about the butter browning process, but the results were good and nothing bad happened. Hooray! Only because you're so awesome. Well, then I suppose its allowed. 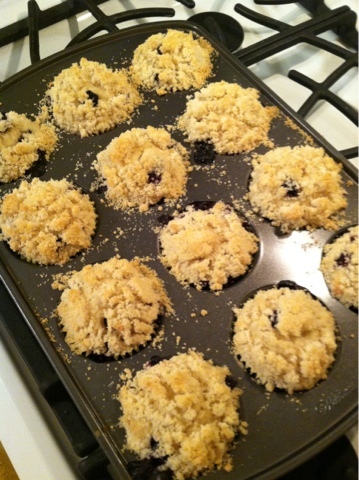 Even our pictures of said muffins look almost identical.